Many of our customers have found that combining O-Mega-Zen3™ with E-Toca-Chi2® and P-Tidyl-Wei1™ and taking all products together greatly enhances the health benefits and effects that they get from taking each product separately. It is well known that as individuals consume more omega-3s and polyunsaturated oils their bodies require natural vitamin E or tocotrienol to support and maintain heart and brain health. There is extensive scientific research that has been done not only on omega-3 DHA for brain and cognitive development but also in relation to cardiovascular health and lipid lowering. E-Toca-Chi2® through its special advanced nutraceutical composition is synergistic with omega-3 DHA and considerably adds to its already significant health benefits. Vegans need omega-3 DHA and much of this DHA cannot be obtained through conventional plant sources. At the same time E-Toca-Chi2® with its special tocotrienol composition of natural vitamin E may serve to amplify the beneficial effects that omega-3 DHA and standard vitamin E are said to provide. Finally, P-Tidyl-Wei1™ is the final touch on the Brain Pak™. Phosphatidylserine PS is a phospholipid that can be found in cells throughout the body. However, it is most concentrated in brain cells where it comprises approximately 70% of overall nerve tissue. It is essential for storage, release, and for the functioning of certain neurotransmitters that govern brain activity. Phosphatidylserine also serves to increase the release of dopamine which is a mood regulator while at the same time increasing reduction of acetylcholine which is used in brain and memory. At the same time phosphatidylserine helps to support glucose metabolism in the brain which helps to fuel brain functions. 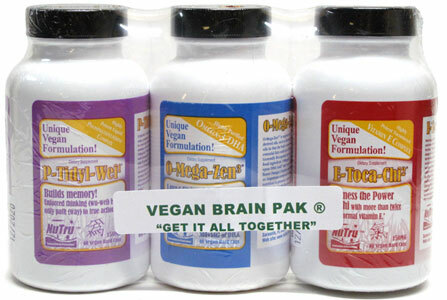 On this basis, we are pleased to make a special offer for our customers so that they can enjoy the special synergistic benefits of O-Mega-Zen3™, E-Toca-Chi2® and P-Tidyl-Wei1™ together to really improve their brain and heart health through this Vegan Brain Pak™. Normally costing $72.85 for all 3 items individually, we're offering this package at a special price of only $64.99! Contains one bottle each of O-Mega-Zen3™, E-Toca-Chi2® and P-Tidyl-Wei1™ for a 40-day supply at the recommended dosage of one capsule of each taken daily. From Anonymous of Annandale, Virginia on 8/31/2012 . I started taking these on a whim, but noticed an increase in my general mindfulness... I was forgetting small things less often (keys, phone,small tasks, etc) and felt unforced thoughts came along more often. When I stopped taking them, those effects vanished. I'm a believer! From Billy of Reno, Nevada on 1/5/2011 . In my 50s and in excellent vegan health. I've always been a bit absent minded about car keys and wallets and lately words have been escaping me a bit. I used these three for six months and took a break. Now I'm eager to order them again. When I add them to my diet I am noticeably sharper. From Rachel Rettinger of Norman, Oklahoma on 12/11/2007 . I was interested in trying these supplements for the Omega 3 veg source and the increased brain function when used together. An additional surprise benefit that is WONDERFUL: increased energy! From Vegan Heathen of Chicago, Illinois on 5/1/2007 . I love how this company is loud and proud about being all Vegan. I highly recommend any of this company's products, especially this combo pack! Love the algae Omega 3 source.